Today we collected the girls’ pavilion entries following yesterday’s local show. It was the first year that I’d sourced a schedule and read through to see if there were any categories that the girls might like to enter. We were a little stuck for time. We learned that you could (and should) have faxed or posted your form in to the Pavilion Secretary a week in advance. Failing that, there are set times on set days during the week leading up to the show to catch said Pavilion Secretary to register your entry. Entries must be registered by Thursday afternoon at the latest and delivered Friday morning at the latest for Saturday’s show. So we rushed into town just before the cut-off time late on Thursday afternoon to register any entries that we may be able to complete between that moment and the following morning. The first category that had caught my eye in the book was: ‘Three decorated Marie biscuits on paper plate (topping must be edible)’. We collected our registration cards at the Pavilion and went straight to the supermarket to buy the Marie biscuits, the paper plates and the edible toppings. On the way in to town I’d thrust the Kids’ Birthday Cakes book onto Elsie’s lap and told her to have a think about what she could put on her biscuits. I told Maeve she could have a think about what she’d like to put on hers. She replied that if we saw a rabbit wearing a blue shirt on the way into town that it might be Peter. On show day there was great excitement, with animals to pat, clowns to feed and show bags to choose. But even more exciting for Elsie was seeing her entries and her success. Her Marie biscuits won second prize, her drawing of a girafish won first, and her hand drawn tractor picture first. 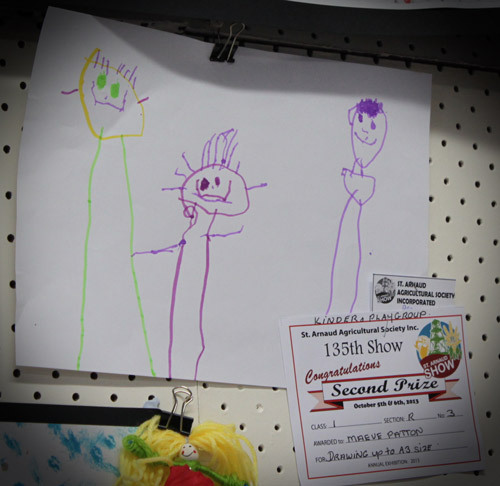 Maeve’s self portrait (with her parents either side of her) won second prize. She didn’t care. After picking up her entries and certificates at the Pavilion today, Anthony asked Elsie what she got for winning. I feel it too. I can see it now. But get in early and get organised. I’m sure it’ll be a lot more fun if you’re not telling them, ‘Good, that’s plenty of icing, noes decorate it. It’s bedtime. You can do the third one in the morning.’ And hoping the third one is dry before you run it into the Pavilion… Go girls – I look forward to hearing what they come up with! Ha ha Larissa I laughed so hard about the Peter Rabbit comment! Ahhh, the stuff childhood memories are made of!!! You just can’t beat country shows. Next year the girls will have to enter the lego section so you can join us mums who have mastered the ability to hastily reconstruct our child’s masterpiece which has scattered into many, many, many pieces after dropping it on the ground somewhere between the car and the pavilion (yes, I am speaking from experience!) Hope the prize money covers the entry fee!! !